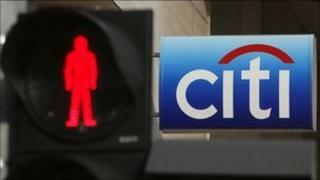 Citigroup profits have soared 24% as the banking giant managed to cut back its losses from bad loans. The bank - the third largest in the US - earned $3.34bn (£2.07bn) in the three months to the end of June. The numbers were well ahead of Wall Street expectations, and the sixth quarterly profit in a row. "It's a good quarter, they're fixing a lot of problems, but they're not out of the woods yet," said Matt McCormick of investment advisers Bahl & Gaynor. But he warned that "the bank still had overall revenue decline, trading declined and they are still taking a lot of quarterly profit from loan loss reserves." The bank's turnover did indeed fall, down 7% from a year earlier, but even that was somewhat better than expected. Citigroup was among the banks that had to rely on government funding in the wake of the global credit crisis. The US government sold off its final share holding in the bank only last December. On Thursday, US bank JP Morgan had reported a 13% rise in quarterly profits, again well ahead of expectations.